View of Black Creek. Vernal pools, hardwood swamps, dense woods and impressive rock ledges are among the stunning, ecologically important natural features on this land that abuts Black Creek, a significant Hudson River tributary. Our purchase of development rights to the property—approved last January for a six-lot residential subdivision—ensures paddlers on the creek will always enjoy vistas of this unspoiled landscape. The transaction brings to nearly 1,000 acres the land we’ve preserved in the Plutarch/Black Creek Wetlands Complex, a prime area for breeding and migrating waterfowl identified in the New York Open Space Plan—a blueprint for the state’s land-conservation efforts. 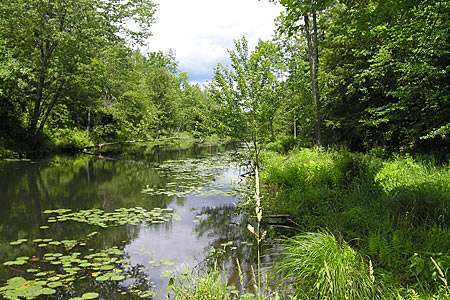 The new acquisition also is within the state-recognized Grand Pond/Chodikee Lake Biologically Important Area (BIA). The A rating assigned the BIA by the Department of Environmental Conservation and its conservation partners means these wildlife habitats is of the highest importance. Further, safeguarded lands in creek and river flood plains will mitigate ecological and property damage from sea-level rises and storm surges under predicted climate-change scenarios. The purchase is part of Scenic Hudson’s collaborative campaign to Save the Land that Matters Most, protecting 65,000 acres of great scenic, ecological and agricultural significance.